← Are You Insured When You Rent an Aircraft? 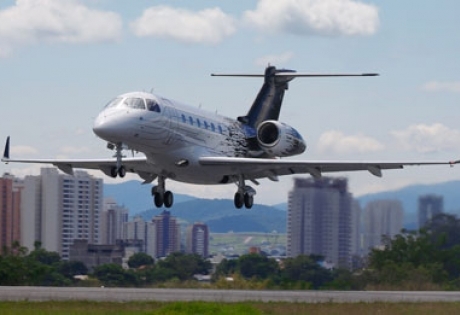 The Embraer Legacy 500 made a “flawless” one-hour 45-minute first flight today from the aircraft manufacturer’s headquarters at Brazil’s São José dos Campos Airport, marking the beginning of the midsize jet’s flight-test program. Embraer test pilots Mozart Louzada and Eduardo Camelier, along with flight-test engineers Gustavo Paixão and Alexandre Figueiredo, flew the fly-by-wire aircraft, performing handling and performance characteristics evaluation. The Legacy 500 achieved first flight today from Embraer’s headquarters in São José dos Campos, Brazil. As a result of the extensive use of simulation and ground testing, the aircraft was able to cover a “significant flight envelope” on the maiden flight, though the company hasn’t yet released speed or altitude data. Aircraft systems were assessed during the flight, including landing-gear retraction. Certification and initial deliveries of the Legacy 500 are expected in early 2014. Its mid-light sibling, the Legacy 450, is slated to cross the certification finish line about a year after that.